Water resources, indispensable to life, are relatively limited with respect to the Earth surface and unequally distributed in the humanized spaces. 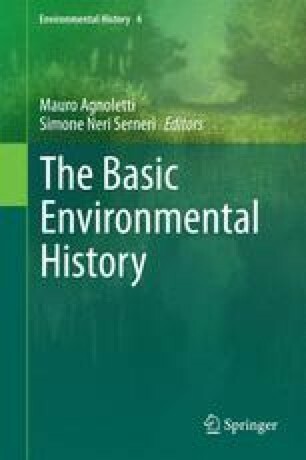 They have been targeted by many different human actions through the centuries, which makes environmental history of water a well represented approach, among environmental history in general. In addition to its use for drinking and cleaning, water has contributed to the development of an increasingly productive agriculture with irrigation; and for centuries, rivers and canals have also played a major role in facilitating the traffic of people and merchandise and have structured the economics of many cities. Historians have emphasized in their researches the changes occurred during the Industrial Era (ca. 1780–1960 in the West). This period was crucial for the use of water resources because of the competition between different activities needing water: washing, factories needing pure water, factories using rivers as a receptacle for their wastes, professional or leisure fishing, etc. With the decrease of industrial discharges and boat traffic, in the last decades of the twentieth century (and mainly in the Western countries), water has been integrated in many urban development programs as a source of leisure and of aesthetic value. Restoration projects allowed for the return of salmon and other fish species, but history raises the question of how to restore. After having played an important role in culture and leisure, water resources remain an object of public policies that nowadays defend a very different goal from the post-WW2 modernist ideologies which led to vast dam and irrigation schemes. Nevertheless, great disparities still exist on a global scale. Climate change, making “wars for water” a potential threat for the next century, can be used by environmental historians to find lessons from the past which could be provided to policy-makers.